Covington City Hall is located at 333 West Locust Street, Covington, VA 24426; phone: 540-965-6300. Photo: Frank and Mattie Hammond House, ca. 1911, 510 Midland Trail Road, Rosedale Historic District, Covington, VA. 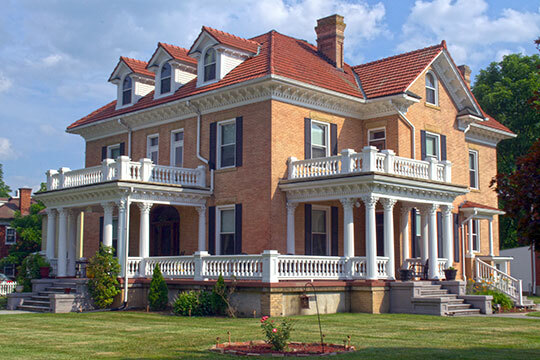 The Historic District was listed on the National Register of Historic Places in 1998. Photographed by User:CZmarlin (own work), 2009, [cc-by-3.0 (creativecommons.org/licenses/by/3.0)], via Wikimedia Commons, accessed July, 2015. While Covington is governed as an Independent City it serves as the seat of Alleghany County. Originally, the first settlers in the Shenandoah Valley (The "Great Valley of Virginia") laid claim to the land of what is now Covington in 1745 when the area was administered by Augusta County. This changed in 1769 when Botetourt County came to control much of the area. Boundaries were not exact and both Bath and Monroe Counties contained portions of present Alleghany County-Covington region. The Robinson family, the Lewis brothers (Andrew and Thomas) and others were granted land in this area. The first settlers, Peter Wright and Joseph Carpenter, moved into this area in 1746. Other families soon followed. The unstable conditions on the frontier and the military threat of attack from Indians caused the Governor of Virginia to investigate the situation. Young George Washington visited the string of frontier forts during the French and Indian War in 1756. Fort Young and Fort Carpenter (a fortified house) were examined. Fort Young was described as sixty feet square with fourteen foot high palisade walls, block houses, ramparts and two (12 foot square) bastions. Throughout a twenty-year period ending in 1774, this area was constantly under threat of Indian attack. Both Shawnee and Delaware raiding parties visited the Covington vicinity with some damage and loss of life. Lord Dunmore's war and the Battle of Point Pleasant (1774) in West Virginia pushed the Indians from this portion of the "American" frontier. Early records in the County Court House show that Dr. James Merry anticipated that this area would become a commercial center by being located at the junction of the proposed James River and Kanawha Canals. This was his motivation for purchasing from George Pence 138 acres in 1817 for $3,000. Dr. Samuel Merry, James' brother, was partner in the purchase. Although Dr. James Merry promoted the idea of the canals and reserved provisions for them up to his death in August 1828, the development of the railroad system squelched all plans for the canals. The original plat for the Town of Covington was drawn by William Anderson, surveyor of Botetourt County on July 23, 1818. Assisting Dr. Merry in laying out the plans for the town were a number of persons who had been officers and participants in the War of 1812. In addition to Captain William Anderson, mentioned above, there was Captain John Pitzer Jr. (who was appointed Sheriff of Botetourt County in 1820 by Governor Thomas Randolph), Capt. Peter Wright, Capt. Moses Mann, Col. John Persinger, Capt. Henry Massie, and Col. John Crow. The consensus of these veterans of the War of 1812 and others was that the town be named in honor of General Leonard Covington, friend of Washington, Jefferson, and William Henry Harrison, and who was mortally wounded at the Battle of Chrystler's Field on November 11, 1813 and died two days later. He was the great hero of the War of 1812. In 1816 Richard Smith was operating a store in Sweet Springs. His store ledger shows that Dr. James Merry was a frequent customer. A year later Richard Smith formed a partnership with Dr. Merry and using his stock from Sweet Springs as his contributory share he opened the store at the terminus of the Lexington-Covington turnpike under the name of Richard Smith & Co. with Dr. James Merry providing the building and additional capital but remaining a "silent partner." Richard Smith was the clerk and sole operator. A public sale of the lots took place on August 24, 1818. Richard Smith was clerk of the sale and William White was the auctioneer. Lots 26 (store location) and 27 were sold to Richard Smith. Lot 26 was later taken back by Dr. Merry and lot 27 had been bought by Richard for his brother William. Richard Smith & Co. was not the first store in the area. In 1795 John Pitzer, who lived in Botetourt County on the James River in what is now Gala, started a store with the help of his sons Bernard and Abraham. On March 7, 1800 Bernard Pitzer bought the tract on both sides of the Dunlap River adjoining the south side of Jackson River from Uriah Humphries and moved the store near "the mouth of the Dunlap." The ledgers of this store all survive and record purchases and transactions of early residents of the area. The store prospered and continued until about the time that Richard Smith & Co. began. The partnership of Richard Smith and Dr. Merry continued until January 10, 1821 when it was dissolved by mutual consent due to accusations by Dr. Merry that Smith was taking merchandise for his own use. By the time of the sale of lots in 1818 it was anticipated that it would be advantageous to form a county to provide local administrative and court services. To record deeds required a two day trip to Fincastle by horse. Accordingly, Alleghany County was formed by Act of the Virginia General Assembly from portions of Botetourt, Bath, and Monroe Counties on January 5, 1822. Despite the sale of the lots, Covington grew very slowly for by 1855 there were only 43 houses on two streets. At this time this was an agricultural community and the prosperity of stores and businesses in the town depended upon those tilling the soil, raising crops and livestock. Industrial development occurred in the 1890s, and this caused the local population to increase and the town to develop its public services. A bond in the amount of $10,000 was authorized in 1892 for sidewalks and sewerage, and the high school (now old City Hall) was built for $30,000 around that time. The first industries included the Covington Iron Furnace in 1891 (in Sunnymeade) which produced 110 tons of pig iron daily, the steam-powered Deford Tannery (near present Superior Concrete plant) in 1892, the E.M. Nettleton planing mill, and the Covington Machine Shops which produced the patented Coke extractors for use in furnace cleaning in the steel making process. Also there were two flour mills, two brick yards and the Alleghany Pin and Bracket Company. MeadWestvaco did not begin operations until 1900 when A. Adams McAllister sold land to the company at a low price as an inducement to locating in Covington. All heavy industries had access to the C & O tracks and utilized the modern energy sources of the time. An interesting point was that there existed a Roberson Process Company (1907) which pumped waste sulphite liquor from MeadWestvaco across the Jackson River for reprocessing. A substance called Glutrin was produced which was used as a binder for making sand cores in furnaces, disinfectants, a briquetting agent for fine iron and coal pyrites. It was claimed that this reprocessing "will use the waste product of the pulp mill, which was formerly turned into the river, and thereby cleanse the water ." The industries were considerate of their employees, and Mead-Westvaco rented company owned houses to the workers or allocated money for individual option for a lot and building. The 1890s were an economic boon to Covington. Population jumped from 704 in 1890 to 2,950 at the turn of the century. The railroad ran fourteen passenger trains daily through Covington and the City was the fourth largest freight paying station on the entire C & O after Chicago, Cincinnati, and Richmond. The discovery of a higher grade of iron ore in a location served by cheaper water-borne transportation and closer to the steel mills of the cities along the Great Lakes caused the local mines to diminish in importance. The open pit iron ore mines in the northern Great Lakes region were detrimental to mining in Alleghany County and the dependent industries in Covington. Gradually the iron mines lessened in importance and began closing in the 1920s. The coming of the Great Depression sealed the fate of iron ore mining, and this enterprise never recovered again in the area. Fortunately for Covington, other industries moved into the area, of which the most notable was Industrial Rayon (now Applied Extrusion Technology, Inc. or AET, Inc.) and Automotive Industries, Inc. (now Lear Corporation). Also the Allied Chemical Corporation assumed control of the former Extraction Plant and continued its operations. After several expansions of the corporate limits, the Town of Covington became a City in 1952. It is governed by a Council-Manager form of government. Covington offers a wide range of services and facilities for its citizens and possesses a sound financial base. As of the year 2001, the City officials are focusing attention on the historic downtown, regional recreational facilities, industrial development at Jamison Commerce Center, neighborhood improvements, commercial growth south of I-64, and tourism. Roanoke Valley-Alleghany Regional Commission and the City of Covington, Virginia, City of Covington Comprehensive Plan, 2002, www.covington.va.us, accessed July, 2015.